Our lives are shaped by the choices we make and these choices always come with a distinct choice architecture that influences which choices we make. For instance, how food is presented in a school cafeteria may influence children to either consume healthy or unhealthy food. Choice architects may design the presentation in such a fashion so that people are nudged to make a (generally) optimal choice while still preserving the absolute liberty of individuals to choose what they want. This is the central message of Nudge: Improving decisions about Health, Wealth and Happiness by Nobel-laureate Richard Thaler (an economist) and Cass Sunstein (a lawyer).They draw upon insights from psychology and behavioural economics to explain that people are often not fully rational and are prone to making non-optimal choices. The rational homo economicus (Econ) is thus not an accurate representation of the actual decision makers that inhabit the world: Humans. Therefore, there are behavioural markets failures since some people make the choices that would not be optimal for them to make. However, by designing choice architecture in a certain fashion policy makers can ensure that humans are able to act as Econs, should they desire to do so. Thus, humans are able to easily make an optimal choice while still being able to choose however they want to. This is the basis of libertarian paternalism, in which the government is responsible for providing its citizens with a good choice architecture. The great benefit of nudges is that they are generally inexpensive, compared with other ways to solve behavioural market failures. Setting up nudges often only involves a clear and transparent system in which choices can be made. Thaler and Sunstein divide their book in five parts. In part I they introduce the reader with behavioural economics and explain why people are susceptible to the influence that choice architecture has on them. In part II they explain certain Nudges with regard to financial decisions. For instance, by setting a default savings rate workers can be influenced to save a substantial pension which they might not have done if they were not nudged towards the default rate. While the workers are completely free to change their savings rate with a simple procedure they rarely do so, as shown by empirical research. Thus, while their inherent preferences are not changed they do act differently when confronted with nudges.In part III they propose nudges with regard to health decisions, such as being an organ donor by default unless you explicitly state that you do not wish to donate your organs. Part IV deals with freedom and happiness and proposes a variety of different nudges. Finally, part V addresses several critiques towards behavioural economics in general and nudging in particular. Furthermore, they propose a list of nudges that are easy and quick to implement while still having the potential to make a substantial difference for the better. Nudging is of course not without its critics. Many object that the government should not intervene in private affairs such as pensions plans, organ donations or even marriage. The government might also not know what the best choice is for individual actors and nudging people towards certain choices may thus prove to be dangerous. Furthermore, nudges may also be implemented by malicious persons or firms, that attempt to use behavioural economics in order to increase their maximum profits. These concerns are all valid and must be taken into account whenever one employs the use of nudging in order to increase the welfare of individuals within a country. Nudging in general however does hold great promises for the future and may certainly help people to make better decisions. The book itself is easy to understand even for those who have no prior experience with psychology, economics or nudging itself. Thaler and Sunstein have succeeded in a book that is both accessible and informative. As part of the Straight-to-Eight projects HOPE XXL has also devised a project that involves the use (or experimentation with) nudging by municipalities in order to enable the inhabitants of these municipalities to make better decisions regarding a multitude of different subjects. 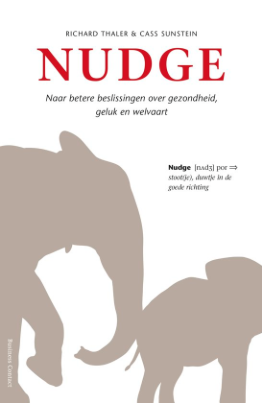 HOPE XXL in 2016 Book review: Why Nudge?